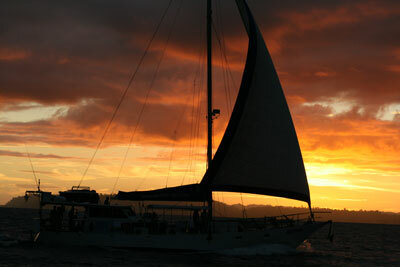 To get the most out of a surf trip to the Mentawais you need the best boat, crew and captain. 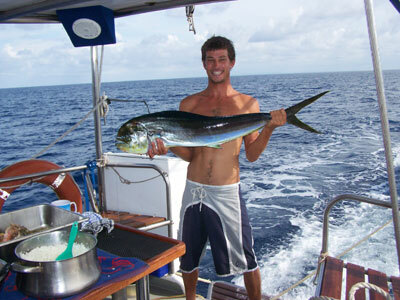 Navistar is an ocean going 65 foot sloop which is owned and operated by Carrick Robinson a keen and experienced surfer. Carrick's mission is to find the best waves possible to surf through out the trip - you get the best waves of your life and a photographer on board to capture those waves and moments. Carrick has been operating the Navistar since 1999. Navistar was built and launched in 1990 in Australia and converted to Mentawais surf charters in 1999. She is powered by a V8 300hp turbo charged Detroit diesel engine which will go anywhere any time. She is fully air conditioned throughout the vessel to what ever temperature you like. The accommodation sleeps 8 passengers comfortably and there are plenty of nice roomy areas to hang out at all over the vessel - inside or out. Navistar has a 14 foot dingy to drop offs and pick ups to and from the Mentawais surf. And also there is fishing gear on board from trolling rods ,spinning rods, hand lines to spear guns to catch those big fish for sport and fun. You can sample the local or western cuisine cooked by the chef with 3 meals served daily after hard days of surfing. Padang airport transfers, 12 nights onboard Navistar, bottled water, hot drinks, sodas, 3 meals a day, and use of all Navistar onboard equipment and facilities: skin diving, fishing rods & reels, TV, DVD home entertainment center and a loud stereo system. Also included is video & photo documentation by the crew with CD's of trip available at additional cost. US$750 deposit required to guarantee individual bookings. US$6,000 deposit required to guarantee group bookings. Final payment due 90 days prior to sailing.